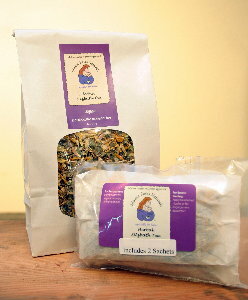 Herbal Sitzbath contains herbs that are useful for healing and soothing discomfort when recovering from childbirth, vaginal infections, or hemmorhoids. Fill Herbal Sitz Bath into the sachet provided, and add to warm bath water to release the essence of the herbs and flowers. If desired, place damped sachet into a soft cloth, and hold it to the vaginal area for a few mintues, or as long as comfortable. You can also infuse Herbal Sitz Bath for 15 minutes in hot water and put into a spray bottle to ease stinging during and after urination.